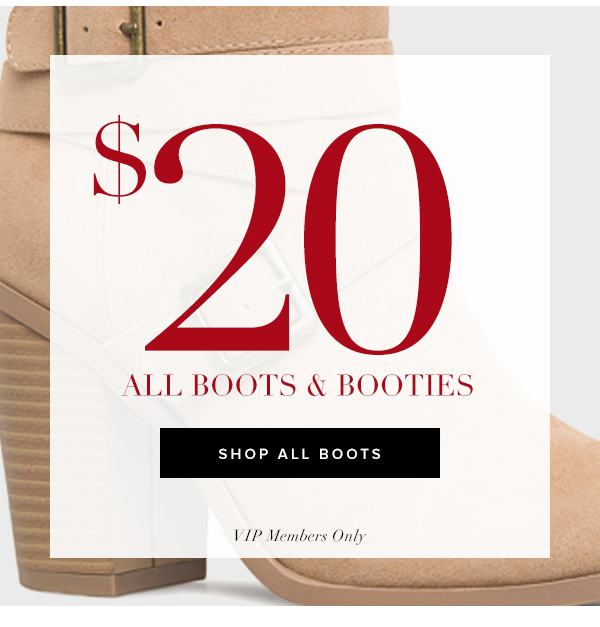 **$20 boots and booties is valid sitewide. Prices will be reflected in cart. Discount applies for VIP Members only. VIP credits, store credit, referral credit and/or any available promotional credit may not be applied to this sale. May not be applied to any previous order. Combinable with other offers. Valid starting 11/14/18 at 12:00 a.m. (PST) and ending 11/19/18 at 11:59 p.m. (PST). Free shipping on VIP Member orders totaling $39 or more only in the contiguous US. Other terms of our Shipping Policy still apply. Discount excludes any applicable taxes or shipping. Terms subject to change at any time without notice.